Finally. The New York Times added a very interesting and eye opening service to its online presence, Times People. Put simply, Times People is a social network inside the Times. For people who spend a portion of their day at the site, this is a wonderful addition. For people who live and die by their RSS reader, this may be the kind of thing that could change news reading habits. It serves as a simple, yet elegant, recommendation managment tool for people you know who read the Times. Each article has a “recommned” link that takes the title and link to the article and drops it into a “drawer” that can be shown and hidden from the top of the Times website. I am currently using it with my wife to see how it works — I am really interested in seeing what this looks like with a bunch of people sharing. Old media is working their asses off to create innovation in a very stale and static place. I doubt this does much for the circulation numbers for the Times, but I can assume that if it catches on it could drastically increase page impressions … and that, of course, could very positively impact advertising revenue. No matter how you slice it up, there is a gem of an idea in this little addition that we should think about. Imagine that type of functionality replacing a big portion of the course management system. Essentially a CMS that follows you around and that you can collect evidence of learning in while you work the web. Clearly there are other social tools that do this kind of thing already, delicious instantly comes to mind, as do instant blogging buttons, and other basic sharing tools. But, I am curious about the potential here to slim down the CMS and have it work for me instead of me working for it — the current pardigm drives me crazy, I have to log into it and then go outside to read things an instructor has linked to. I just wonder how taking a slightly different approach would change the way students use the web for learning. Imagine opening your browser and seeing a small to do style toolbar that is populated from across your required learning activities. Hitting these sites triggers a check mark next to the readings/activities assigned to you. Making it a two way street would enable students to tag things for other students to read. One could even tag a writing activity completed in their own blog that would show up in the instructors view of the system. I don’t know, maybe I am really reaching, but the idea of having something that looks and feels more bottom up and organic leads me to believe we could see more active engagement online with content. Am I making any sense? Any thoughts? And oh, join the Times People feature and let me know so I can follow your recommendations. Couldn’t agree more. The best example of this was my research methods class, one half term content and concept learning plus hands on skill building with survey tools and SPSS. Second half was creating and using the ideas for teams to create a project. The ‘kicker’ came when I found an entry on the ‘feed back to instructor’ page (during a conference away) in which they *explained* to me that they were taking over the course and I would be the facilitator. We were using a beautiful simple precursor to SAKAI at the time that had very few bells and whistles but a lot of easy to use social interlinks. Nice to see we might coming full circle! Seems like a nice little feature. 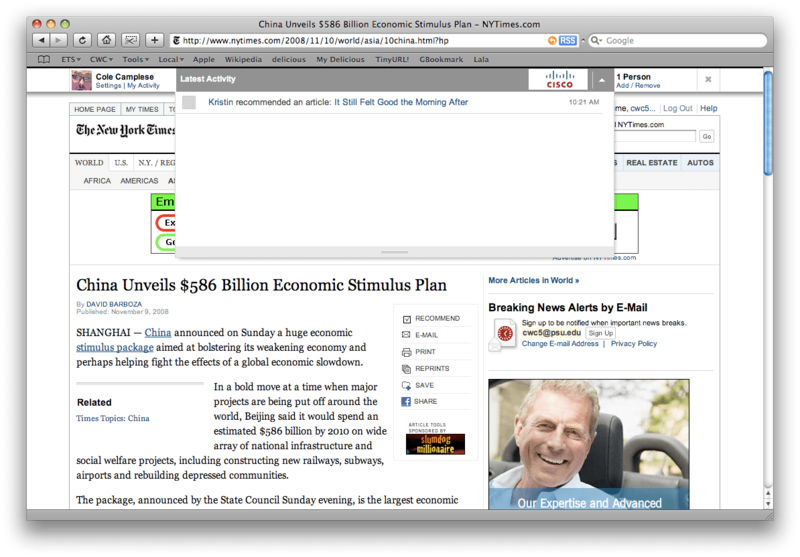 I will be interested to see if it is enough to draw me into using the NYT on the web more. I guess I am still old fashioned in that way – I just don’t read papers online. It looks like that is the way of the future however, and RSS can’t keep me up to date forever. Your concept is a nice twist on adding some new features to an individual educational profile. Do you really dislike CMSs because of the interface, or because learning is not individualized? For me it’s the latter. The inability for a student and mentor to get together, identify topics that are specific to the individual and then have a diagnose and prescribe electronic guide “attached” to the online experience is really holding back education. Add to that the Web 2 – let’s share neat things – stuff, and you;d have an environment that students would actually anticipate, not just show up for. The failed promise of Learning Management Systems. I tried Times People last night. It’s interesting. When I checked the link to post my articles to Facebook one of my students noticed I was on and asked me if I had graded that day’s quizzes yet! I had to admit I was watching TV instead. This could replace the newspapers on campus program. It has always bothered me that faculty can’t get the newspapers unless we promise to use them in class. But there aren’t that many articles that apply to my discipline (forestry). Shouldn’t they have given us access first and then checked up to see if we were using it? With Times People I could get my students to link in and find appropriate articles without asking anyone’s permission. And if they don’t want to join Times People they can see the articles on Facebook. Peter … an excellent point! Using a tool like this within a classroom, selecting reading assignments would fit really easily into your work flow — sitting on the couch reading and watching TV and you stumble upon an excellent article in the NYT … just recommend it and all the students following would see it. I wish getting them to actually read it were as simple!